I was a little premature in my plans to grill these Pork Kebabs last night, as it was quite cold and was accompanied by few snow flakes. I was extremely excited to give this new recipe a try, as the kebabs can be ready in just 1 hour from start-to-finish; perfect for a weeknight summer meal. My older son loved the kebabs and ate 2 full skewers (he rated them highly; 4-stars). While the technique resulted in perfectly cooked pork, I was disappointed that the promise of the hot/sweet/salty flavors was not, in the end, well-balanced. The pork was too sweet, lacking heat and salt. Overall, an easy 1 hour meal. Worth making, but I can rate it only 3-stars. The recipe was not clear as to when to ignite the charcoal. If you are pressed for time, I would recommend lighting it right after salting the pork. The recipe will take a total of 45 minutes. Last night I followed the order of the recipe and ignited after the preparing the skewers, which may have allowed the flavors to be absorbed by the pork; and added about 25 minutes. The ingredients call for a total of 1-1/2 pounds of pork tenderloin, and the in-package weight of mine was 2-1/2 pounds. I didn’t check the final trimmed weight, and am not sure if that was the cause of lack of salt. Also, the balance of flavors was overly sweet. It lacked a little heat from the Sriracha and salt. I minced 1/4 cup of cilantro, but didn’t use all. If using a gas grill, pre-heat for 15-minutes with all burners to high before cleaning and oiling the grill. When cooking, just leave the primary burner on high. All other burners should be turn off. Check to see if your pork is enhanced (i.e. injected with a salt solution), and if so do not sprinkle with salt in step 1. Start time 5:15 PM. Ready at 6:30 PM. Trim away the silverskin and any extra fat from the tenderloin. Cut into 1″-cubes. Add to a large bowl and sprinkle with 1 teaspoon kosher. Toss until combined and allow to stand for 20 minutes at room temperature. Meanwhile, in a small bowl whisk together brown sugar, Sriracha, and cornstarch together. Measure out 1-1/2 tablespoons of the Sriracha mixture and set aside from brushing the meat on the grill. After the 20 minutes has passes, add the remaining Sriracha mixture to pork and toss until evenly coated. Thread the pork cubes onto four-to-five 12″ skewers; leave 1/4″ between the pieces of pork. 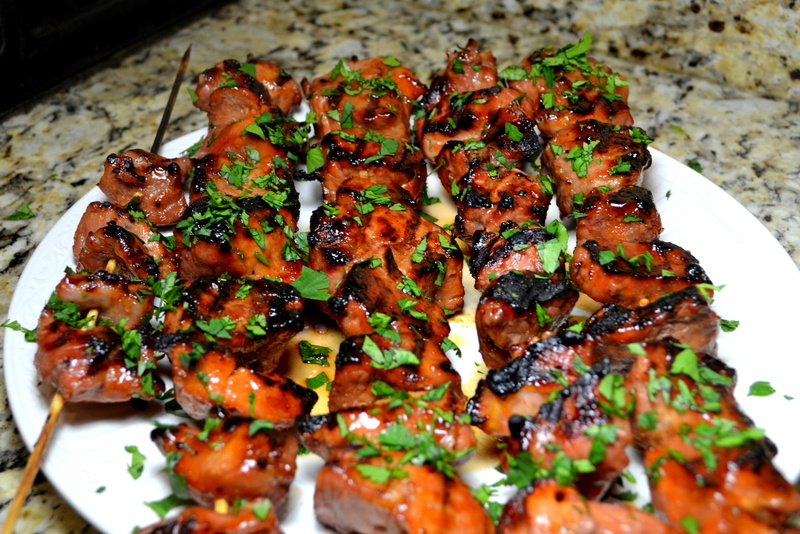 Generously spray both sides of meat skewers with vegetable oil spray. Open the bottom and top vents completely, and ignite a chimney starter filled with charcoal; about 6 quarts. After 20 minutes and the top coals become partially covered with ash, empty over half the grill leaving the other half empty. Replace cooking grate, cover and pre-heat for 5 minutes. Clean and oil cooking grate. Put pork on hot side of the grill for about 4 minutes until well charred. If it’s a cold day I recommend covering; otherwise leave uncovered. Flip over and brush the tops with reserved Sriracha mixture. Cook the second side for about 4 more minutes; take the internal temperature of the meat and remove when it registers 140-degrees. Remove to a serving platter, loosely tent with aluminum foil, and allow to rest for 5 minutes. Sprinkle with minced cilantro and serve. While visiting my brother in Las Vegas, I had some doubts about making Jerk Chicken on a Gas Grill. Yet, the chicken itself ended up well seasoned and delicious. The 24 hour marinade permeated deep into the chicken, and also left a dark flavorful crust. Overall, the recipe was a success. The main drawback about making this on the gas grill, was that I was not able to get proper aroma and smoke flavors coming from the spice-filled smoking packet. When I put the smoking packet on the grill grate above the burner, the packet didn’t become hot enough to generate much smoke. Then when I placed it directly on the burner element, the wood chips simply caught fire. You should make this recipe even if you only have a gas grill, but still this charcoal grill version is better. 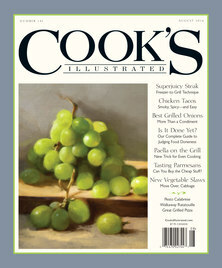 Before Chris Kimball made this recipe, I tried to make Jerk Chicken on my own, but it came out just so-so. Chris Kimball’s only previous Jerk Recipe because used 1/4-cup of brown sugar, which seems absurd to me. Be sure to marinate the chicken for a full 24-hours, otherwise your flavor will not permeate into the meat of your chicken. If you don’t properly clean and season the grill in step 6 then the skin will stick to the grill. I used 5-lbs of thighs and allow the chicken to marinate for 24 hours. I still had a little room to throw in two boneless breasts for the last couple of hours to marinating; a back-up plan for any spice-o-phobe. 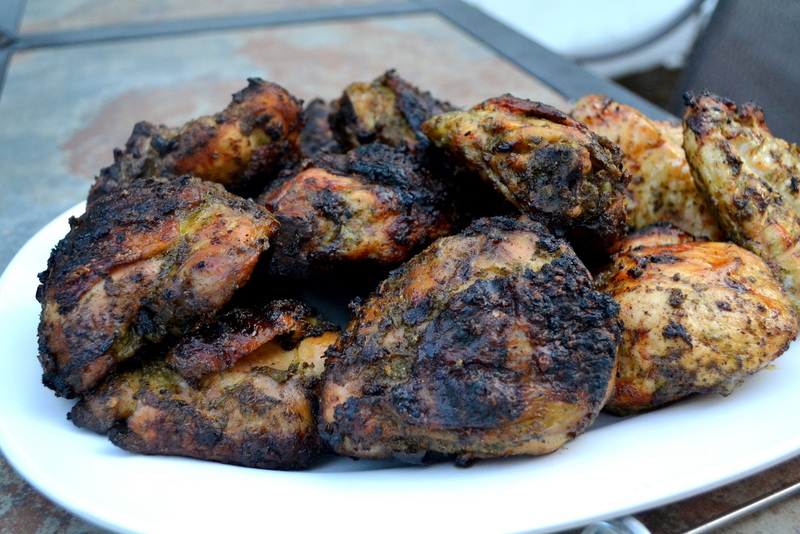 If you go to Jamaica, the only thing better than Jerk Chicken is Jerk Pork. Coarsely grind the whole coriander seeds, the allspice berries and whole peppercorns in a spice grinder. Add freshly ground spices to blender. Discard the stem from the chiles. Remove and reserve the ribs and seeds, then cut into quarters. Add to blender. Roughly chop scallions and garlic and add to blender. Add all the remaining ingredients (except the chicken) to the blender and process until a smooth paste forms. Empty the paste into a gallon-sized Zip-Lock bag. Trim the chicken to remove any excess fat (or ribs) and cut the breasts is half cross-wise. Add the chicken to the marinade and remove as much air as possible from the zip-lock bag. Allow to sit a room temperature for 30 minutes; flipping the bag over after 15 minutes. Refrigerate for 24-hours. Combine the spices for the smoke packet with 2 tablespoons water in a small bowl, and allow to hydrate for 15 minutes. Meanwhile, soak 1 cup of wood chips separately. When completely soaked, wrap the soaked chips and moistened spice mixture in heavy-duty aluminum foil. Use a paring knife to cut five or six vent holes in top of the packet. Set the wood chip packet over the primary burner and turn all burners onto highest setting. Close cover, and pre-heat grill for 15 to 25 minutes until the wood chips begin to smoke. Reduce primary burner to medium and turn off other burners. Use tongs and paper towels to season the grill grate with vegetable oil (otherwise the skin will stick to the grill). Leave some marinade on the chicken, and put chicken skin-side-up as far away from the heat as possible. Arrange so that the dark meat is closest to the heat, and the white meat is further. Cover grill and cook for 30 minutes. Flip chicken skin-side-down as you move the chicken directly over the primary burner. Cook for until well browned. Flip the chicken again skin-side-up and continue cooking directly over primary burner until the chicken reaches the correct temperature; 160 degrees for breasts and 175 degrees for thighs/drumsticks. Move to a serving platter and tent loosely with aluminum foil for 5 minutes. Slice limes for serving. Later that morning, we entered the Grand Canyon from the East and drove the 25 miles from the eastern entrance to Grand Canyon Village; stopping at the many view points along the canyon’s rim. The Grand Canyon is one of this countries most touristic parks with nearly 5 millions visitors per year. The crowds grew larger as we neared the village. Even though it is nowhere near peak season, walking along the rim trail I was overwhelmed by the crowds and tour groups. Yet with a little effort, I was able to escape the intense crowds. Hiking down into the canyon on the Kaibab trail to Ooh-Ahh point took just 1 hour. The switchbacks taking you off the rim are nerve-racking, and the views from Ooh-Ahh point are breathtaking. Overall a smooth and wonderful trip. I have a mental list of places that I want to take my two sons. 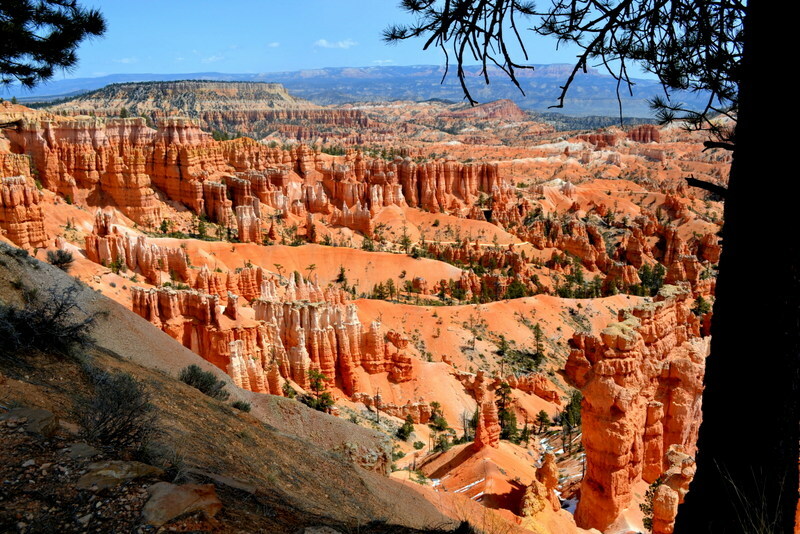 Despite that it is one of the lesser known National Parks, Bryce Canyon has always always been high on that list. I remember going when I was 13 years old with my parents; one of my best childhood vacations. For me, hiking amongst the Hoodoos turned out to be an unforgettable experience. I was happy to see that my own sons also enjoyed themselves. We hiked down the steep switchbacks into the canyon and walked between the towering walls of red rock. We took the longest trail of 5-1/2 miles, and ended up vertically climbing half mile. It was an exhausting hike, but I am glad to have shared it with my sons. The expansiveness of Bryce is hard to show without losing the uniqueness of its geological formations. This is truly like no other place on earth. You are currently browsing the My Year Cooking with Chris Kimball blog archives for April, 2015.